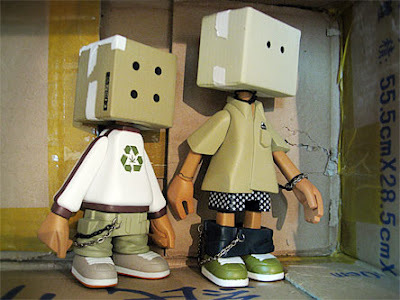 Whenever I talk about the urban vinyl/designer toy/art toy culture to non-collectors, I always drop the name of Michael Lau, the Hong Kong toy designer who pioneered it. In the late 90s, when toy figures consisted mainly of superheroes, robots, anime/movie characters, and Barbie/Ken-types, Lau created figures that were a reflection of the thriving youth culture. Instead of metallic armors and space suits, his toy figures wore hoodies, hip-hop jeans, chains, earrings, tattoos and cool rubber shoes. They were known as the 12-inch Gardeners, a collection of 100+ 'cool dudes' that were rare as they were unique. Today, you won't be able to get hold of one – they are completely sold out, and no collector will ever want to part with his. You have better chances of scoring a 6-inch vinyl version. Below are two of them – Box B (with the recycling symbol) and Box C (with his pants down). 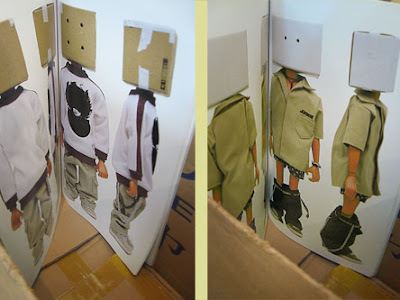 (Below) Snapshots of Michael Lau's Gardener book: The original 12-inch versions of the box head dudes. Of course, Lau has also designed Bearbricks, two of which are shown on top. 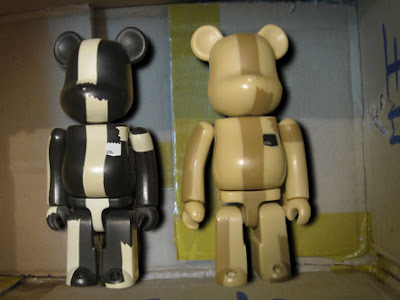 These two 'packing tape' Bearbricks were produced by his own company called Crazysmiles for the August 2002 Toycon in Hong Kong. You can see they were inspired by the Box Gardeners. A Michael Lau Bearbrick that I'm really dying to have (in case they decide to mass produce it in a smaller size) is the one below – a 24-inch one-of-a-kind bear that was part of the Bearbrick Worldwide Tour exhibition. 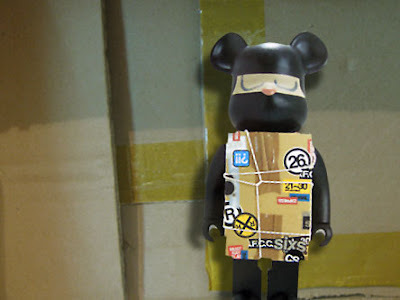 A Bearbrick packed with Lau's originality, no less.